Life-saving donations of breast milk will be delivered to premature babies in South Australia following the launch of the state's first milk bank. 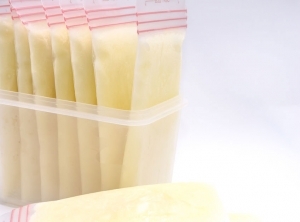 The Australian Red Cross Blood Service has established its first milk bank in response to the demand for pasteurised donated breast milk for premature babies at Adelaide's Women and Children's Hospital and Flinders Medical Centre. Currently, neo-natal intensive care units at the hospitals do not have access to a regular supply of donated breast milk for premature babies, whose mothers often struggle to supply a sufficient amount of milk. The service, which has been launched on Tuesday in partnership with the South Australian government, will collect excess breast milk from mothers in the metro Adelaide area and send it to the Blood Service's Sydney processing centre where it will be tested, processed, stored, then distributed. "We're thrilled to be able to supply pasteurised human milk," milk bank manager Christine Sulfaro told AAP. "There's been quite a lot of interest." It is estimated 300 litres of milk per year will be needed to meet the demands of the two South Australian NIC units, Ms Sulfaro said. Donors will have to meet eligibility criteria, established through a lifestyle questionnaire and blood test to screen the donor for infectious diseases. Crucially, mothers must show they have enough milk for their own babies and answer questions about their baby's health before they can donate. The milk is also tested using a pre- and post-pasteurised sample before it can be passed on to the hospitals. Every year, approximately 23,000 babies are born premature in Australia, including around 150 premature babies in South Australia, Ms Sulfaro said. There are 24 NIC units across the country, but only four of these units have a milk bank within their existing facility. Lactation consultant Dr Jennifer James says breast milk gives premature babies a greater chance of survival, especially from necrotising enterocolitis, a potentially fatal disease that attacks the gut and mostly affects very premature babies. "Breast milk is a unique living fluid ... nutrients within breast milk are irreplaceable," Dr James told AAP. "The human gut is most responsive and most efficient at digesting human milk." Premature babies born before 36 weeks often don't have the energy stores or developmental maturity to breastfeed, said Dr James, former director of Lactation Consultants of Australia and New Zealand. "Ideally, the program will also be for sick babies, babies born to mothers that are very ill ... sometimes mothers end up in intensive care," she said. When asked about the program's possible expansion, Blood Service's Ms Sulfaro said the organisation was working closely with the NSW government to set up a milk bank in the state. "We would welcome the opportunity to work with the NIC units and state governments," Ms Sulfaro said.